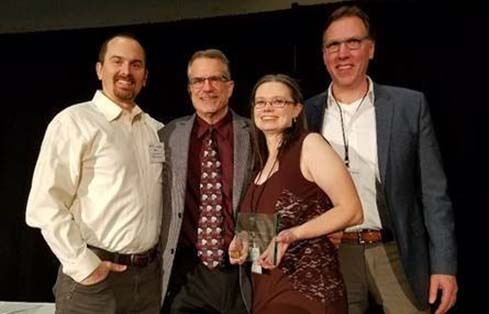 The American Council of Engineering Companies (ACEC) Washington Chapter recognized two GeoEngineers projects with awards for their outstanding client satisfaction and technical contributions. ACEC Washington recognized the hard work of these project teams at their 51st Annual Engineering Excellence Awards and Gala on January 19, an event emceed by GeoEngineers COO Dan Campbell. GeoEngineers’ Palermo Data Gaps and Feasibility Study received a Gold Best in State Award in the Client/Owner Satisfaction category. The award recognizes the groundbreaking subsurface investigation that is the latest phase of the long-running Palermo Wellfield Superfund Cleanup in Tumwater, Washington. GeoEngineers is working with client Washington State Department of Transportation (WSDOT) to identify the impact and extent of solvents in the soil and groundwater, and then design a plan to remediate the site. Project team members Nick Rohrbach, Lara Linde, Rick Moore and Mike Hutchinson attended the gala and received the award. ACEC selected the Palermo project in part because of the unique way that GeoEngineers, WSDOT and the Environmental Protection Agency have built strong relationships based on mutual respect, communication and cooperation. This unusual alliance of client, owner and regulator is ensuring that this complex environmental project moves forward efficiently and safely. GeoEngineers’ team used membrane interface probe (MIP) direct-sensing technology to provide the most complete possible picture of the soil and groundwater at Palermo. The approach was used in combination with other lines of evidence to detect low-level contamination across approximately half a square mile—one of the most comprehensive studies of a low level diffuse chlorinated solvent plume ever done in EPA’s Region 10. Because this approach provided nearly immediate results, it also allowed the joint GeoEngineers/WSDOT/EPA team to adjust the drilling program on-the-fly and determine the extent of contamination more efficiently. The LNG Site Seismic Study and Ground Improvement project received a Bronze Best in State Award in the Future Value to the Engineering Profession category. The project was part of Puget Sound Energy’s (PSE’s) high-profile Liquefied Natural Gas (LNG) facility in Tacoma, Washington. The new facility will cool natural gas, delivered via pipeline, to its liquid form and then store up to 8 million gallons of LNG for use as a supplemental energy source during times of peak demand on the PSE power grid and for fueling marine transport vessels. Key members of the project team for the award-winning PSE LNG Seismic Study and Ground Improvement Project at the ACEC Gala. Left to right: King Chin, Jim Hogan (PSE), Rick Moore, Jennifer Kauhane (PSE), Dave Phelps and Morgan McArthur. The location for the LNG facility, the Tacoma tideflats, is vulnerable to soil liquefaction and slope instability during an earthquake. This presented a design challenge for the facility, which had to adhere to extremely rigorous state and federal safety standards. GeoEngineers performed a detailed seismic study using a performance-based engineering approach to model soil behavior during two design earthquake levels, and then developed a robust ground improvement program to mitigate seismic risks. The GeoEngineers team designed and oversaw the installation of more than 2,000 36-inch diameter grout columns extending up to 100 feet below the planned foundation. GeoEngineers also provided guidance for management of the spoils and water generated by the ground improvement process. 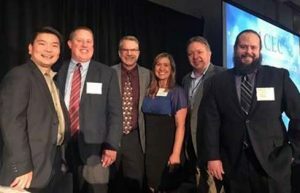 More than 70 GeoEngineers staff worked on the project, but key contributors Dave Phelps, King Chin, Morgan McArthur and Rick Moore were at the ACEC Gala on Friday to accept the award. Both projects represent GeoEngineers’ commitment to industry-leading work in the Puget Sound region, and beyond. By working intimately with clients like PSE and WSDOT, GeoEngineers looks for technical solutions that efficiently accomplish project goals while reducing costs and protecting public health. Nick Rohrbach, Rick Moore, Lara Linde and Mike Hutchinson show off the Gold Best in State Award they won for their work on the Palermo Wellfield Superfund Project.